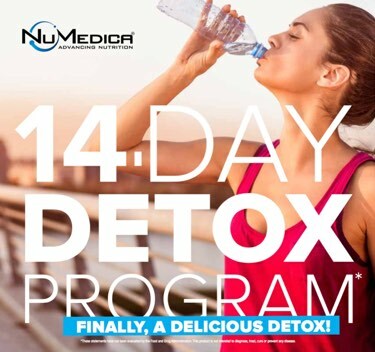 NuMedica's 14 Day Detox Program is about decreasing the level of toxins in your body and lowering the glycemic load of your diet. 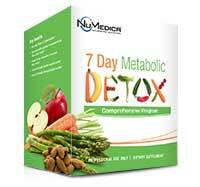 NuMedica's detox program includes an easy-to-use Program Guide and four high-quality, professional-grade supplements. The program guide shows you how to get started and includes your daily shake recipes, shopping list, sample menus and healthy lifestyle tips. The supplements are taken twice daily in the form of vegan protein shakes and 4 daily capsules which support healthy detoxification and enhance the activities of hepatic detoxification enzymes. Curcumin (also known as curcuminoids) is the active ingredient in turmeric. It has powerful anti-inflammatory effects and is a very strong antioxidant. The biggest challenge of using curcumin products is its bioavailability. Curcumin is poorly absorbed because it is mostly lost in the digestive process before it reaches the bloodstream. NuMedica Liposomal Curcumin provides 250 mg of curcuminoids delivered in phosphatidylcholine liposomes for optimal absorption and bioavailability. These liposomes transport the curcuminoids trough the intestinal wall into the bloodstream where it can reach the intended target. NuMedica Power Greens Premium is the "souped-up" version of NuMedica's Power Greens product line. Available in Berry flavor, this superfood drink mix includes a greater selection of SuperFoods and Phytonutrients for even more vitamins and minerals. It contains 50 Powerful Superfoods known to be rich in nutrients that are good for your health. They are mostly plant-based but may include some fish and dairy. Blueberries, salmon and kale are examples. NuMedica Total Vegan Protein is a delicious blend of five plant proteins: pea, rice, hemp, chia, and cranberry. These hypoallergenic, vegan proteins are combined with healthful ingredients designed to support bone health and the immune system and can even enhance the digestive tract by improving the detoxification process. Choose Chocolate or Vanilla protein flavor. Stir or blend shake ingredients into 8 - 10 ounces of cold water. Take each shake once per day or as directed by your healthcare practitioner. To increase sweetness, use less water. To decrease sweetness, add more water. During week 2 adding the Power Greens® Premium to your afternoon detox shake will increase metabolic support. Don't forget to DRINK WATER - about 1/2 of your body weight in ounces of quality water each day.